Not Verified | Brisbane to Sydney. Qantas has improved since I last flew with them. 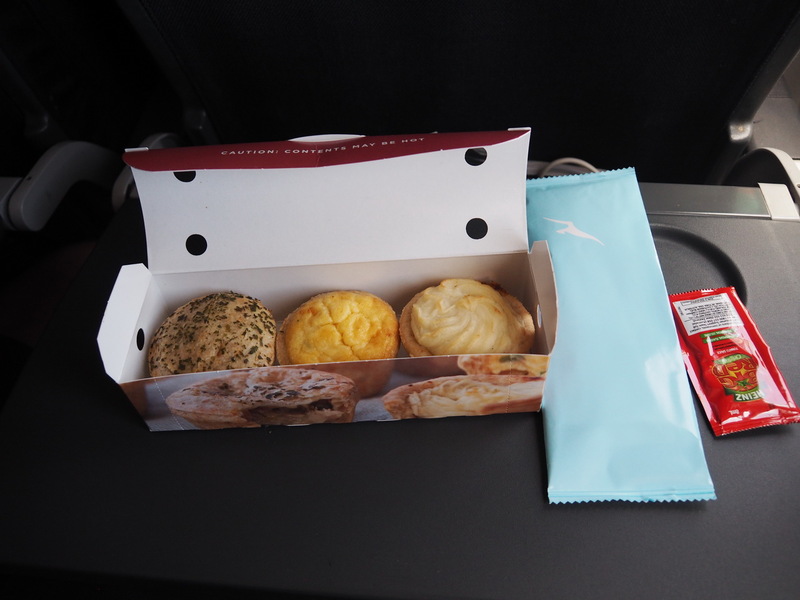 On my flight we were served lunch, a delicious beef and onion pie, and juice/soft drinks. I bought a glass of white wine. Cabin crew were friendly and efficient. ✅ Trip Verified | Hong Kong To Sydney Via Brisbane. 2 days before my flight, I received a notice from Qantas my Request for an upgrade to Business Class for the first segment was successful. The Hong Kong to Brisbane flight started off with some much needed Lounge visits, followed by an on time departure. I had mixed opinions about Cabin Crew, friendly but very robotic. The food onboard didn't help either, I only had a main dish and it was just not great thought desert was decent. The suite was super comfy and I actually had a decent sleep. The IFE was good, not great comparing compared to past experience. After passing through Brisbane airport procedures and changing terminals, I was on my second flight home to Sydney. The domestic flight was very routine, nothing outstanding. ✅ Trip Verified | Melbourne to Singapore. Air staff were friendly and efficient, and chatty when approached at the galley. Staff were generous with the drinks service and snacks when requested. "food and service was great"
✅ Trip Verified | Singapore to Melbourne. Baggage drop staff were extremely happy to help with a seat change, explaining a variety of options both upstairs and below. Boarding was extremely well organised and easy. When I realised I was starting to have my first ever panic attack, I approached staff in the galley during boarding and let them know what was going on for me, and requested a solo seat if possible after take off. They were extremely kind and helpful, rearranged seating before take off, providing water, a hug, and offers of company as well as privacy. Three seperate staff checked unobtrusively in order to confirm I was able to fly, and as soon as staff were able to move about after takeoff, I was checked on again and provided a chocolate bar and more water. Staff were very kind throughout the flight, balancing both my need for privacy and providing care. The food and service was great, as was the IFE. ✅ Trip Verified | Melbourne to Sydney. I enjoyed the cabin crew hospitality. They were very attentive and friendly. While the red wine served (a 2016 cabernet sauvignon) was really good, the food offering was pretty average. ✅ Trip Verified | Melbourne to Los Angeles via San Francisco. My recent trip to Canada via the United States with Qantas was quite variable in the quality of experience between two of their premium products. We flew Premium Economy on the A380 from Melbourne to Los Angeles and then were happily upgraded from premium to business on the new 787 from San Francisco to Melbourne on our return. The service in Premium was exceptional - the best I have experienced. The food was delicious - for me a stylish and well presented lamb shank and my wife a terrific fish dish. And the service was cheerful and frequent - including regular water service and snacks. Breakfast was similarly good. Top marks all round. The business leg that we were so anticipating on the return was a little disappointing. The food prepared by the caterers in the states was surprisingly tasteless, overcooked in every case and disappointing - both meal services. The salad with supper was simply indescribable. The crew were much less conspicuous on this flight (of course the idea is to not be too conspicuous) but you didn't feel encouraged to ask for anything. No water runs and little sight of the crew. And they were very short of PJs in business and were all one size. This time around the choice of movies was surprisingly thin. The new seats in business were OK but not exceptional. ✅ Trip Verified | Brisbane to Sydney by QF525. This flight was a code share flight. I bought the ticket by China Southern, so the flight number was CZ7552. But there was no information screen in the airport showing this flight number. The boarding was on time. 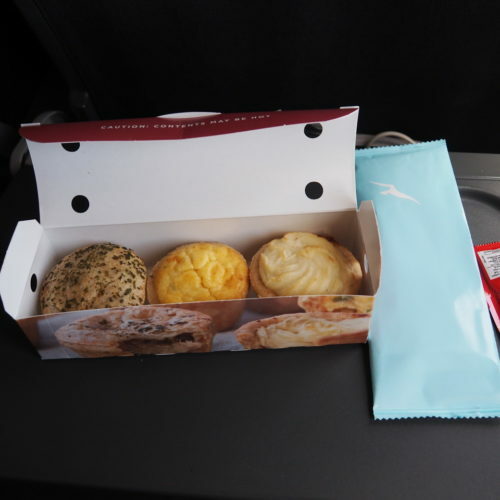 The flight time was only 2 hours, but the staff gave some cakes to every passenger. ✅ Trip Verified | Singapore to Melbourne. Similar to the review by Loke Foo of 13 March 2019, I also have issues with the A330-200 business class overnight flight, this time Singapore to Melbourne. The seat is narrow and when reclined to the bed position I felt hemmed in. As a tall person with large feet, the narrow confines of the footrest area prevented me sleeping on my side. The provision of only one toilet for 28 premium passengers on an overnight international flight is unacceptable for an airline that claims to be a premier, full service airline. Whoever made this decision needs to be given a reality check about the expectations of premium paying passengers. Finally, the egg and bacon roll presented at breakfast looked like a lacquered show-case you see in Asian restaurant windows. The egg was dry and tasteless. But full marks to the crew who gave excellent service. They must find it extremely frustrating and annoying trying to provide good service with a near constant queue of passengers waiting in and around the galley for the one toilet, but they always kept their cool and highly pleasant demeanor. ✅ Trip Verified | Dallas to Brisbane via Sydney. Awesome experience, had the most lovely check in with Peter, his friendliness and attention to detail was nothing short of wonderful. Attentive service both ways, great food offerings and a homely feel. Can’t recommend enough! ✅ Trip Verified | Los Angeles to Brisbane. I took two Qantas flights recently to visit Australia. The first from Los Angeles to Brisbane, and the second was the return portion from Sydney to Vancouver, Canada. They were the two single worst flights I've taken in 20 years of flying. On both flights my gluten free meal didn't make it. 28 hours flying time without food. Even though I ordered it 4 weeks before departure, I was told they didn't receive it in time (?!). A few minutes later, the same cabin attendant then gave me a bread roll and a regular meal as if we hadn't just has a conversation about gluten allergies. After picking at something I thought I might be able to eat I became painfully ill. A pain that lasted 3 days after the flight. As I was getting off the flight, a cabin crew member told me it was my own fault for eating their food. Nice touch Qantas. The return flight was worse. It was delayed by 25 hours due to an engineering issue. This resulted in a missed connection which gate staff assured me would be reimbursed so long as rebooking occurred through the One World network. After paying significantly more money to stay within the network, and presenting the receipts as instructed, Qantas customer service told me they wouldn't be reimbursing the cost. Furthermore, they lied about providing passengers with a letter at the gate explaining this. No such letter was ever given to passengers. So I arrived 25 hours late, +$500 out of pocket, and most gallingly, after following every instruction given to me by Qantas staff, being told by customer service that it was my own fault. How does this airline even exist in 2019? From gate staff, to cabin crew to customer service, every single person was rude, condescending and confrontational, not a single one of whom accepted responsibility for anything. Every single inconvenience, delay and cost, no matter how small, was my problem, my fault and my cost to bear. Never, and I can't stress this enough, never fly with Qantas. No airline is more deserving of bankruptcy.